We just finished the 8th annual Lean LaunchPad class at Stanford. The team presentations are at the end of this post. It’s hard to imagine, but only a decade ago, the capstone entrepreneurship class in most universities was how to write – or pitch- a business plan. As a serial entrepreneur turned educator, this didn’t make sense to me. 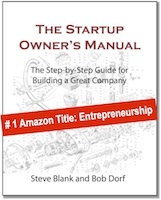 In my experience, I saw that most business plans don’t survive first contact with customers. So in 2011, with support from the Stanford Technology Ventures Program (the entrepreneurship center in the Stanford Engineering School), we created a new capstone entrepreneurship class – the Lean LaunchPad. The class was unique in that it was 1) team-based, 2) experiential, 3) lean-driven (hypothesis testing/business model/customer development/agile engineering). This new class aimed to mimic the uncertainty all startups face as they search for a business model while imparting an understanding of all the components of a business model, not just how to give a pitch or a demo. Ninety days after we first offered this class at Stanford, the National Science Foundation adopted the class calling it the NSF I-Corps (the Innovation Corps) to train our country’s top scientists how to commercialize their inventions. 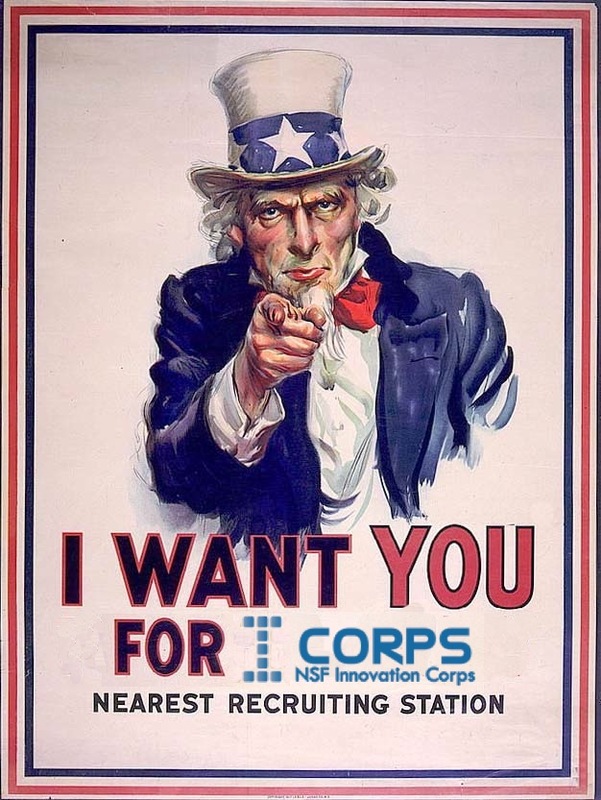 I-Corps is now offered in 88 universities. The National Institute of Health teaches its version in the National Cancer Institute. (I-Corps @ NIH). (The NIST report on Unleashing Innovation recommended expanding I-Corps and the House just passed the Innovators to Entrepreneurs Act to do just that.) 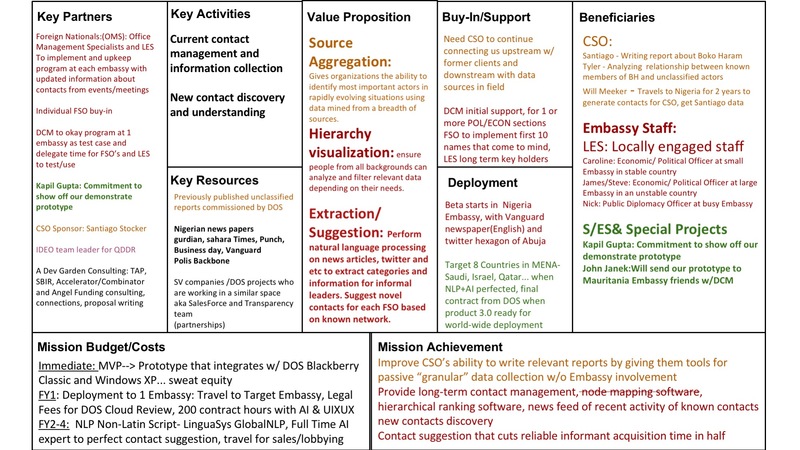 The Lean LaunchPad/I-Corps syllabus is the basis for a series of Mission-Driven Entrepreneurship classes; Hacking for Diplomacy, Defense, Energy, Oceans, non-profits and cities. If you had dropped by in 2011, the first time I taught the class, and then stuck your head in today, you’d say it was the same class. The syllabus is almost identical, the teams still get out of the building to do customer discovery every week, then come back to class and present what they learned weekly, etc. But while it’s the same, it’s different. After thousands of students taking this class, here are a few ways the class has changed. I’ve always believed that great classes continue to thrive after the original teachers have moved on. While I created the Lean LaunchPad methodology and pedagogy (how to teach the class) and the train-the-trainer course for the NSF I-Corps, the sheer scale and success of the class is due to the efforts of the 100’s of National Science Foundation instructors and the NSF. 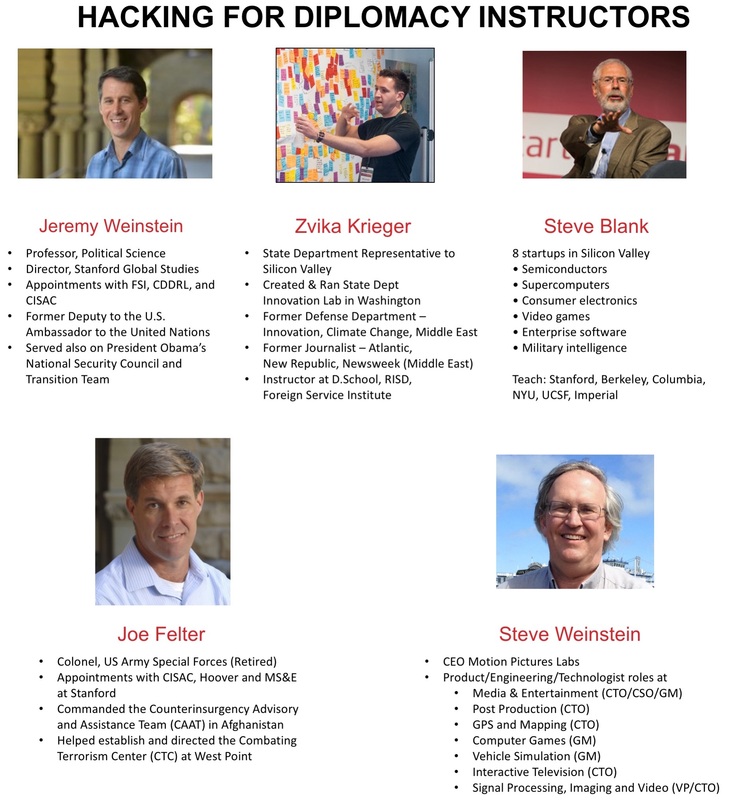 And while I created the original course, the Stanford class is now led by Jeff Epstein and Steve Weinstein. To be honest, as I watch other instructors now run these classes, I feel a proud “passing of the torch” though touched by moments of King Lear and Kurosawa’s Ran. Way past my ad hoc activities, the Stanford teaching team has thoroughly professionalized the class. In addition to the lead instructors, the Stanford teaching team now includes George John, Mar Hershenson, and Tom Bedecarre, all generously volunteering their time. Each of them brings decades of industry experience to the class. This type of teaching firepower and headcount was necessary as the teaching team expanded the class size to meet student demand. At Stanford we limited the class to 8 teams – four students per team. However, this year, the class was so oversubscribed, and the quality of the teams applying was so high, the teaching team admitted 14 teams and reverted to the original NSF model of separating into sections. The additional teaching team members made it possible. When we started this class, the concept of Lean (business models, customer development, agile, pivots, mvp’s) was new to everyone. Now they’re common buzzwords, and most of the students come in with an understanding of Lean. This head start has allowed the teaching team to accelerate the velocity and depth of learnings past the basics. In past years, the student teams in the Stanford classes were weighted toward men, reflecting the makeup of the applicants. While Ann Miura-Ko was part of the original teaching team, having all male instructors for the last five years didn’t help. After Mar Hershenson joined the teaching team last year, she made an all-out effort to recruit women to apply. A role model as a successful CEO and VC, Mar successfully sparked interest in women students and sponsored women-only lunch sessions, mixers and meetings to introduce them to the class. As you’ll notice from the presentations below, the result was that this year 50% of the applicants and accepted teams were women. The lessons for me were: 1) the class had been unintentionally signaling a “boys-only” environment, 2) these unconscious biases were easily dismissed by assuming that the class makeup simply reflected the applicant pipeline, and 3) when in fact it required active outreach by a woman to change that perception and bring more women into the pipeline and subsequent teams. My original vision for the class was to use the business model canvas as a framework to teach engineering students all the nine elements of the business model: customer, distribution channel, revenue, get/keep/grow, value proposition, activities, resources, partners and costs. And instead of the traditional income statement, balance sheet and cash flow, discover the key “metrics that matter” for their business model. Admittedly this was tough to do, because in one quarter teams haven’t yet found product/market fit and are loath to move off it until they do. But since my goal was to teach a methodology rather than to run an accelerator, I traded off time on product/market fit for exposure to the rest of the canvas. If we were designing a curriculum rather than just a single class, we’d offer it as two semesters/quarters – the first searching for problem/solution and product/market fit, and the second half focusing on the rest of the canvas testing feasibility and viability. As you look at this year’s presentations, you can see the presentations still tend to focus on product/market fit. Obviously, there is no right answer to what and how to teach, and the answer may change over time. Our Teaching Assistants keep all the moving parts of the class running. Each years TAs have continued to make the class better (although I must admit it was interesting to watch the TAs remove any uncertainty from what students need to do week-to-week, as I had designed a level of uncertainty into the class to mimic what a real-world startup would feel like.) The teaching team and TA’s have added an enormous number of useful diagnostics to measure student reactions to each part of the pedagogy and the overall value of the class. However, the real art of teaching is to remember that the class wasn’t designed by a focus group. Finally, the mentors (unpaid industry advisors) who volunteer their time have been professionalized and managed by Tom Bedecarre. Each mentor’s contribution gets graded by the students in the team they coached. The same holds true for pushing the students. Every time we slacked off relentlessly direct feedback we saw a commensurate drop in the quality of the teams output. In the end, this class is not only about what the instructors try to teach the students but also about whether students processed what we intended for them to learn. Over time, two of our major insights were: 1) teams needed a week to process all they learned, and 2) we needed to teach them how to turn that learning into a story of their journey. This year all our teams accomplished that and much, much more. And after 9 years of classes, students still find that this class is the closest thing to being in a real startup. Take a look at their presentations below. I was in Boston and was interviewed by The Growth Show about my current thinking about innovation in companies and government agencies.The interviewer was great and managed to get me to summarize several years of learning in one podcast. At the end of the interview I got surprised by a great question – “What’s the Problem that Still Haunts You?” I wasn’t really prepared for the question but gave the best answer I could on the fly. Part of the answer is the title of this blog post. 20:18 Is Innovation doomed in Companies and Government? 27:45 Why Does the Government need to be Innovative? 39:04 Hacking for Energy, Hacking for Non Profits, Hacking for X..
We just finished our second Hacking for Defense class at Stanford. Eight teams presented their Lessons Learned presentations. Hacking for Defense is a battle-tested problem-solving methodology that runs at Silicon Valley speed. It combines the same Lean Startup Methodology used by the National Science Foundation to commercialize science, with the rapid problem sourcing and curation methodology developed on the battlefields in Afghanistan and Iraq by Colonel Pete Newell and the US Army’s Rapid Equipping Force. Our primary goal was to teach students entrepreneurship while they engaged in a national public service. Today if college students want to give back to their country they think of Teach for America, the Peace Corps, or Americorps or perhaps the US Digital Service or the GSA’s 18F. Few consider opportunities to make the world safer with the Department of Defense, Intelligence Community or other government agencies. Our second goal was to teach our sponsors (the innovators inside the Department of Defense (DOD) and Intelligence Community (IC)) that there is a methodology that can help them understand and better respond to rapidly evolving asymmetric threats. That if we could get teams to rapidly discover the real problems in the field using Lean methods, and only then articulate the requirements to solve them, could defense acquisition programs operate at speed and urgency and deliver timely and needed solutions. Finally, we also wanted to show our sponsors in the Department of Defense and Intelligence community that civilian students can make a meaningful contribution to problem understanding and rapid prototyping of solutions to real-world problems. Our mantra to the students was that we wanted them to learn about “Deployment not Demos.” Our observation is that the DOD has more technology demos than they need, but often lack deep problem understanding. Our goal was to have the students first deeply understand their sponsors problem – before they started building solutions. As you can imagine with a roomful of technologists this was tough. Further we wanted the students to understand all parts of the mission model canvas, not just the beneficiaries and the value proposition. We wanted them to learn what it takes to get their product/service deployed to the field, not give yet another demo to a general. This meant that the minimal viable products the students built were focused on maximizing their learning of what to build, not just building prototypes. The Hacking for Defense class was designed as “fundamental research” to be shared broadly and the results are not subject to restriction for proprietary or national security reasons. In the 10 weeks the students have, Hacking for Defense hardware and software prototypes don’t advance beyond a Technology Readiness Level 4 and remain outside the scope of US export control regulations and restrictions on foreign national participation. Eight teams spoke to over 800 beneficiaries, requirements writers, program managers, warfighters, legal, security, customers, etc. Seven out of the eight teams realized that the problem as given by the sponsor really wasn’t the problem. Their sponsors agreed. Over half the student teams have decided to continue working on national security projects after this class. Each of the eight teams presented a 2-minute video to provide context about their problem and then gave an 8-minute presentation of their Lessons Learned over the 10-weeks. Each of their slide presentation follow their customer discovery journey. All the teams used the Mission Model Canvas, Customer Development and Agile Engineering to build Minimal Viable Products, but all of their journeys were unique. The teams presented in front of several hundred people in person and online. The video of the team presenting is below. You can see all their slides right below this video. Hacking for Defense is now offered at eight universities in addition to Stanford – Georgetown, University of Pittsburgh, Boise State, UC San Diego, James Madison University, University of Southern Mississippi, and later this year University of Southern California and Columbia University. We established Hacking for Defense.org a non-profit, to train educators and to provide a single point of contact for connecting the DOD/IC sponsor problems to these universities. The Department of Defense has expanded their use of Hacking for Defense to include a classified version, and corporate partners are expanding their efforts to support the course and to create their own internal Hacking for Defense courses. Another surprise was how applicable the “Hacking for X…” methodology is for other problems. Working with the State Department we offered a Hacking for Diplomacy class at Stanford. If you’re interested in learning how to apply a “Hacking for X…” class in your workplace or school we’ve partnered with the 1776 incubator in Washington DC to offer a 2-day “Hacking for X…” certification course 26-27 July for those interested in learning how. Sign up here. Joe Felter a retired Army Special Forces Colonel with research and teaching appointments at Stanford’s Center for International Security and Cooperation (CISAC), the Hoover Institution, and the dept. of Management Science and Engineering. Joe is the incoming Deputy Assistant Secretary of Defense for South and Southeast Asia. Pete Newell is a retired Army Colonel currently a Senior Visiting Research Fellow at the National Defense University’s Center for Technology and National Security Policy and CEO of BMNT Partners. Steve Weinstein a 30-year veteran of Silicon Valley technology companies and Hollywood media companies. Steve is CEO of MovieLabs the joint R&D lab of all the major motion picture studios. Our teaching assistants were all prior students: Issac Matthews our lead TA, and Melisa Tokmak, Jared Dunnmon, and Darren Hau. We were lucky to get a team of 25 mentors (VC’s and entrepreneurs) who selflessly volunteered their time to help coach the teams. 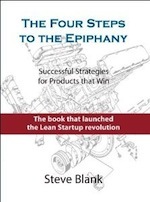 Thanks to the team Lean Startup mentors: Paul Dawes, Tom Bedecarre, Kevin Ray, Craig Seidel, Daniel Bardenstein, Roi Chobadi, Donna Slade, and Rafi Holtzman and other advisors; Lisa Wallace, Peter Higgins, Steve Hong, Robert Medve. We were privileged to have the support of an extraordinary all volunteer team of professional senior military officers representing all branches of service attending fellowship programs at Stanford’s Hoover Institution, and Center for International Security and Cooperation (CISAC) and Asia Pacific Research Center (APARC) at the Freeman Spogli Institute (FSI). These included: Colonel Lincoln Bonner (US Air Force), Colonel Curtis Burns (US Army), Captain Kurt Clark (US Coast Guard), Lieutenant Colonel Kurt Helphinstine (US Air Force), Colonel Seth Krummrich (US Army)), Commander Leo Leos (US Navy), Lieutenant Colonel Eric Reid (US Marine Corps), Colonel Mike Turley (US Army), and Colonel Dave Zinn US Army. Additional volunteers from the active duty military providing support to our teams included Lieutenant Colonel Donny Haseltine (US Marine Corps), Captain Jason Rathje (US Air Force), Major Dave Ahern US Army) and, Major Kevin Mott (US Army). And finally a special thanks to our course advisor Bill Perry, former Secretary of Defense and Professor Emeritus, and Tom Byers, Professor of Engineering and Faculty Director, STVP. When Colonel Peter Newell headed up the Army’s Rapid Equipping Force (REF) he used lean methods on the battlefields of Iraq and Afghanistan to provide immediate technology solutions to urgent problems. Today, his company BMNT does for government and commercial customers what the Rapid Equipping Force did for the U.S. Army. Pete and I created the Hacking for Defense class (with Joe Felter and Tom Byers.) One of the problems our students run into is that there are always multiple beneficiaries and stakeholders associated with a problem, often with conflicting value propositions and missions. So how do you figure out whose needs to satisfy? Here’s Pete’s view of how you do it. Unlike businesses, government organizations don’t sell products, and they don’t earn revenue. Instead, they have missions to accomplish and very hard problems to solve. They use a variant of the Business Model Canvas – the Mission Model Canvas – to map their hypotheses, and they get of the building to do beneficiary discovery. (A beneficiary can be a soldier, program manager, commanding general, government contractor, stakeholder, customer, etc.) And just like in a commercial business they are trying to determine whether the value proposition solves the problem and helps the beneficiary accomplish their mission. Discovery for both business and government is similar in that the only way to do it is to turn assumptions into facts by generating hypotheses, developing Minimum Viable Products and getting out of the building to test those MVP’s in the trenches where the customers and beneficiaries work. Early in the discovery process, teams are faced with a cacophony of personalities and organizations. Often, they struggle with understanding which person or group represents a beneficiary, supporter, advocate or potential key partner. It’s only through repetitive hypothesis testing that they begin to sort them all out. It’s in the trenches however, where things become different. Unlike their commercial counterparts, government problem solvers are often faced with multiple beneficiaries associated with a problem, often with conflicting value propositions. As these differences become apparent, teams must make decisions about the value proposition trade-offs between conflicting beneficiaries – sometimes even pivoting completely in favor of one beneficiary to the detriment of another. During last year’s Hacking for Defense class at Stanford Team Aqualink experienced the conflicting beneficiaries’ problem. The result was a significant pivot of both beneficiary and value proposition. Aqualink started with a problem given to them from the chief medical officer of the Navy SEALS – they had no way to understand chronic long-term health issues divers face. Divers work 60 to 200 feet underwater for 2-4 hours, but Navy doctors currently have no way to monitor divers’ core temperature, maximum dive pressure, blood pressure, pulse and the rebreather (air consumption), or the dive computer (dive profile) data. Having all this new data would give a diver early warning of hypothermia or the bends. More importantly the data would allow the medical director to individually assess the short and long-term health of each diver. And medical researchers would have access to detailed physiological data. The medical director tasked the team with building a wearable sensor system and developing apps that would allow divers to monitor their own physiological conditions while underwater and to download it for later analysis. In the first week of the class this team got out of the building, suited up in full Navy diving gear and did customer discovery by spending an hour in the life of the beneficiary. But as the students on the Aqualink team spoke to the SEAL team divers, (another one of their beneficiaries), they experienced an existential crisis. Most of the divers were “ambivalent” (read hostile) about the introduction of a vitals monitoring platform, (“If you gave to us at 0900, it would end up on the bottom of the ocean by 0905.”) Having worked so hard to get into the SEALS, no diver wanted doctors telling them they could no longer dive. After further questioning, the team discovered the reason the divers were spending so much time underwater – they often did not know where they were. To find out, they had to get a GPS fix. This meant their minisub (called the SEAL Delivery Vehicle) had to rise to within 6 feet of the ocean surface so the GPS antenna could broach the surface. And to do so they had to surface slowly to avoid giving the divers the bends. Now the team had a dilemma. They would have to decide which beneficiary to focus on – the SEAL Team medical director, who was the sponsor of their problem, or the operators of the delivery vehicle and divers within SEAL Delivery Vehicle Team One, along with their immediate chains of command in SDVT-1 and Naval Special Warfare Group 3. As Aqualink shows, getting out of the building – interviewing the beneficiaries, drawing their workflows and mapping a day-in -their-life – will give you a more complete picture of the context in which a proposed problem exists. Talking to multiple beneficiaries will lead to better understanding of the entire ecosystem of the problem. Often this will show that the problem you have been given is merely a symptom of a larger problem, or is the result of a different problem. Cross check the results of your discovery between different beneficiaries. Often, you’ll find that they seldom have a complete understanding of one another’s workflows and pain points but instead are championing the solution to a mere symptom of a different problem. Share what you learned in discovery among the different beneficiaries. This will arm you with the tools needed to get them (or their leadership) to agree on the right problem that needs to be solved first. In many cases this will lead to your first pivot! The goal is to sort out who has a value proposition that must be addressed first. While discovery with multiple beneficiaries can be confusing and exhausting, there is immense power when all the beneficiaries work together. Therefore, the goal of customer discovery is not just to understand the pains and gains of individual beneficiaries, but to find a shared purpose between all of them. Once they understand they share the same goal, they can solve pain points or create gains for each other using the resources they already control. A “shared” sense of purpose is a very powerful step in the pathway towards a deployable solution. When the Department of Energy asked BMNT to build a training program for getting veterans into advanced manufacturing jobs, we saw the power of a shared purpose between multiple beneficiaries first hand. The problem we were asked to solve is that of the 10,000 veterans who leave military service every month, many remain unemployed or underemployed, yet at the same time the number of unfilled advanced manufacturing jobs in the U.S. is expected to climb to over a million by 2020. From a business perspective, obtaining technically qualified talent is among the top constraints to growth in the US. While we initially thought the beneficiaries of the effort were the veterans, we quickly discovered there were other beneficiaries in advanced manufacturing. We found these additional beneficiaries had different pains and gains which in turn required different value propositions to solve their problems. Universities needed to grow their enrollments. Our discovery showed us universities were willing to create programming for Advanced Manufacturing, but first needed to see a business case for how it would increase their enrollment to make it a worthwhile effort. Industry needed to attract and hire qualified employees. We learned that technically qualified employees within industry were in such demand that the number one way to get qualified employees was to pilfer them from others. Government Agencies needed to help their communities build skilled labor pools to attract new industries. And we learned that our initial beneficiary, veterans leaving service, didn’t need internships or low-paying jobs, but needed jobs that paid enough to support their families. We found each of these beneficiaries had a shared purpose. And each of them had a value proposition that would create a gain or relieve a pain point for another beneficiary. These were big ideas. We found that as these overlapping value propositions emerged, we used the results to get the beneficiaries to come together in a workshop designed to jointly create a shared minimum viable product that they could then use to test within their own organizations. Bringing the groups together in a workshop also served to align value propositions between beneficiaries by demonstrating that there was a way to create a single program that served all their needs. And we created an environment that allowed each beneficiary to discover that the other beneficiaries were partners they could work with in the future. What was the impact of bringing the beneficiaries together in a workshop and creating this beneficiary ecosystem for advanced manufacturing? Lawrence Livermore National Lab (LLNL) created a veterans’ jobs program. They teamed with a local college to create internships that allowed veterans to work during the summer. In turn, the local college created additional advanced manufacturing classes to meet LLNL’s technical needs and the regional workforce investment board provided funding. In Fort Riley, the Army base in Kansas, the military teamed with Kansas State University to create an advanced manufacturing program. Kansas State created a series of advanced manufacturing classes. Soldiers leaving the service can take these courses at a nearby campus beginning up to six months before they leave service. An unexpected consequence is that today there are soldiers from Fort Riley using advanced manufacturing processes to create parts for vehicles and equipment at the Army base. Government problem solvers will often be faced with multiple beneficiaries with different value propositions. Share what you learn from different beneficiaries with each other to sort out which has a value proposition that must be addressed first. The benefit of having multiple beneficiaries is that their strengths can be used to help one another create gains and relieve pains for one another. Creating a shared sense of empowerment from working together smooths the pathway towards scaling the right solution. When you’re up to your neck in alligators, don’t forget the goal was to drain the swamp. I love teaching because I learn something new every class. The latest “aha” moment for me when I was at Columbia University teaching an intensive 5-day version of the Lean LaunchPad/I-Corps class. The goal of the class is to expose students to the basics of the Lean Methodology – Business Model Design, Customer Development and Agile Engineering. In this short version of the class, students (in teams of four) spend half their day out of the classroom testing their hypotheses by talking to customers and building minimum viable products. The teams come back into the class and present what they found, and then they get out and talk to more customers. Repeat for 5 days. All teams talk to at least 50 customers/ partners/ stakeholders, and some manage to reach more than 100. One of the teams wanted to create a new woman’s clothing brand. The good news is that they were passionate, smart and committed. The not so good news is that other than having been customers, none of them had ever been in the fashion business. But hey, no problem. 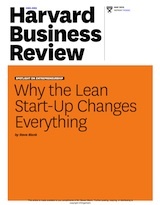 They had the Lean Startup model to follow. They could figure it out by simply talking to customers and stores that carry unique fashion brands. How hard can this be?! By the second day the team appeared to be making lots of progress – they had talked to many women about their clothing line, and had marched up and down NY stores talking to buyers in clothing boutiques. They built detailed value proposition canvases for each customer segment (young urban professional woman, students, etc.) – trying to match customer pains, gains and jobs to be done with their value proposition (their new clothing line.) They were busily testing their hypotheses about customer segments and value proposition, seeing if they could find product/market fit. In listening to them it dawned on me that I had fallen victim to teaching process rather than helping the teams gain insight. I asked them to remind the class what business they were in. “We’re creating a clothing fashion brand,” was the reply. I asked, “And how much fashion brand expertise do you have as a team?” “None, we’re using customer discovery to quickly acquire it.” On the surface, it sounded like a good answer. But then I asked, “Has anyone on your team asked if any of your 120 classmates are in the apparel/fashion business?” After a moment of reflection they did just that, and eight of their classmates raised their hands. I asked, “Do you think you might want to do customer discovery first on the domain experts in your own class?” A small lightbulb appeared over their heads. A day later, after interviewing their classmates, the team discovered that when creating a woman’s clothing brand, the clothing itself has less to do with success than the brand does. And the one critical element in creating a brand is getting written about by a small group (less than 10) of “brand influencers” (reviewers, editors, etc.) in fashion magazines and blogs. Whoah… the big insight was that how you initially “get” these key influencers – not customers or stores – is the critical part of creating a clothing fashion brand. This meant understanding these influencers was more important than anything else on the business model canvas. The team immediately added brand influencers to their business model canvas, created a separate value proposition canvas for them and started setting up customer discovery interviews. In an existing market there is a track record for how new entrants create a brand, get traction and scale. Many of the key insights about the business model and value proposition canvases are already known. Ironically, when I was entrepreneur I knew and practiced this. When I started a new venture in existing markets I would spend part of my initial customer discovery attending conferences, reading analysts’ reports and talking to domain experts to understand current market entry strategies. (None of this obligated me to follow the path of other companies. At times I took this information and created a different strategy to disrupt the incumbents.) But as an educator I was getting trapped in teaching the process not the strategy. The fashion brand team’s experience was a great wake-up call. Focus part of your initial customer discovery on learning competitive insights. Describe how those companies entered the market. What was critical? But I haven’t forgotten that before everyone else thought that teaching scientists how to build companies using Lean Methods might be a good for the country, there was one congressman who got it first. 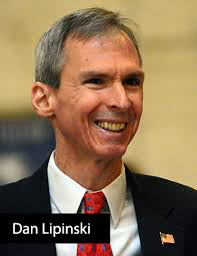 IN 2012, Representative Dan Lipinski (D-Il), co-chair of the House STEM Education Caucus, got on an airplane and flew to Stanford to see the class first-hand. I-Corps uses everything we know about building Lean Startups and Evidence-based Entrepreneurship to connect innovation to entrepreneurship. It’s curriculum is built on a framework of business model design, customer development and agile engineering – and its emphasis on evidence, Lessons Learned versus demos, makes it the worlds most advanced accelerator. It’s success is measured not only by the technologies that leave the labs, but how many U.S. scientists and engineers we train as entrepreneurs and how many of them pass on their knowledge to students. I-Corps is our secret weapon to integrate American innovation and entrepreneurship into every U.S. university lab. We just held our final week of the Hacking for Diplomacy class, teaching students entrepreneurship and “Lean Startup” principles while they engaged in national public service applying advanced technologies to solve global challenges. Seven student teams delivered their final Lessons Learned presentations documenting their intellectual journey over just 10 short weeks in front of several hundred people in person and online. And what a journey it’s been. Our sponsors treated our students like serious problem solvers who could contribute unique technical skills and unfettered customer access. In exchange the sponsors got access to fresh ideas, new technology and a new perspective on serious problems. By the end of the class our sponsors inside State had experienced a practical example of a new and powerful methodology which could help them better understand and deal with complicated international problems and apply technology where appropriate. And finally, our students learned that they could serve their country without having to put on a uniform. Today, if college students want to give back to their country, most think of Teach for America, the Peace Corps, or Americorps or perhaps if you wanted to offer your technical skills, the US Digital Service or the GSA’s 18F. Few consider opportunities to make the world safer with the State Department, Department of Defense, Intelligence Community or other government agencies. Hacking for Diplomacy Lessons Learned presentations are different. Each team presents a two-minute video to provide context about their problem and then presents for eight minutes about the Lessons Learned over their ten weeks in the class. As an example, Team Trace worked with the State Department Office to Monitor and Combat Trafficking in Persons. The team was challenged to help companies push policies of responsible business lower down the supply chain. The key thing to note in this presentation is not only that the team came up with a solution, but also how in talking to 85 people, their understanding of the problem evolved, and as it did, so did their solution. (see Slides 12 and 25). If you can’t see the video click here. If you can’t see the presentation click here. Team Hacking CT was sponsored by Bureau of Counterterrorism and Countering Violent Extremism with the goal of deterring individuals from joining violent extremist groups. After 100 interviews, the team realized that a bottom-up approach, focusing on support for friends and family of those at risk for radicalization, might be effective. Each of the teams used the Lean Startup methodology. For those new to Lean, the process has three key components. First, students took the problems they got from their State Department sponsors and transformed those into what we call hypotheses. For instance, one problem was: “We need to improve coordination among all the organizations trying to help Syrian refugees.” That’s a big, unwieldy problem. Students had to break it down into a series of hypotheses. They had to identify who were the beneficiaries and stakeholders, and think about what specific service they were going to provide them, how they were going to get it to them and who was going to pay for it. To help them do that, we have them map their nine critical hypotheses onto a single sheet of paper called the Mission Model Canvas. Then in step two, the teams got out of the classroom to test these hypotheses through interviews with people in the real world. Every team spoke to close to 100 potential “beneficiaries,” partners and stakeholders including NGOs, tech company executives, supply chain managers, foreign service officers in embassies around the world, and even refugees. While the students were interviewing, they also employed the third piece of the Lean methodology: building the solution incrementally and iteratively. These solutions, called Minimal Viable Products (MVP’s), are what allow the teams to become extremely agile and responsive. As teams talk to stakeholders they gather evidence to either validate, invalidate or modify their hypotheses. If they find out that their assumptions are wrong (and almost all do,) they Pivot, that is, they make fundamental changes to their hypotheses, instead of blindly proceeding forward simply executing a plan. This ability to gather data, build and test MVPs, and then change course is what gives Lean it’s tremendous speed and agility to deliver rapid solutions that are needed and wanted. As they developed MVPs, our students took these solutions out into the real world for feedback. At first the solutions were nothing more than drawings, wireframes or PowerPoint slides. As they came to understand their problems more deeply, they refined their solutions into the final products we saw. For example, Team 621 – Fatal Journeys worked with the State Department Bureau of Population, Refugees, and Migration. The team’s challenge: how to get more data on missing or perished refugees. In this presentation, note how the team’s understanding of the problem evolved over the course of talking to 88 people. They realized there was a missing link between key stakeholders that limited identification of perished refugees and prevented emotional and legal closure for their families. The team pivoted three times as they gained deeper and deeper insight into their problem. With each pivot, their solution radically changed. (Their first pass of problem/solution understanding is on Slides 1-29, but then they get additional insight in slides 36-50. Finally, slides 51-64 is their third and final iteration). In the Netflix age, suspense is an increasingly rare commodity. If we’re intrigued by an hour of “House of Cards,” we need not delay gratification – we can just queue up the next episode and push play. But following Stanford’s Hacking for Diplomacy class over the last 10 weeks has been like watching a TV drama the old-fashioned way. There were cliffhangers every time, and you had to wait seven days to find out what would happen next. The class, which meets just once a week but requires massive outside work, is run not as a traditional lecture where professors drone on in front of passive students — just the opposite. It’s the students standing up in front, discussing what they’ve found out in the past seven days, what progress they’ve made, what obstacles they’ve run smack into. The teachers sit in the back row and lob questions and critiques forth — sometimes very direct critiques. That format keeps students and teachers alike on the edge of their seats. And just when you thought a team had struck upon a brilliant notion for a product, they’d report back during the next session that everyone they put it in front of hated it. I started looking forward to each Thursday at 4:30 p.m. like my parents looked forward to watching “Dragnet” as kids, because the suspense was killing me. Thursday’s season finale did not disappoint. Teams that just two or three weeks ago seemed to be foundering pulled off some amazing comebacks. Take Team Exodus, which had spent a substantial part of the quarter focused on how to match private companies seeking to assist Syrian refugees with NGOs working in the field. Late in the term, the students scrapped that idea after finding competitors who were already deeply engaged in that space. They did a major pivot and decided to concentrate directly on refugees as customers — building on all they had learned during their first eight weeks of interviewing and research. 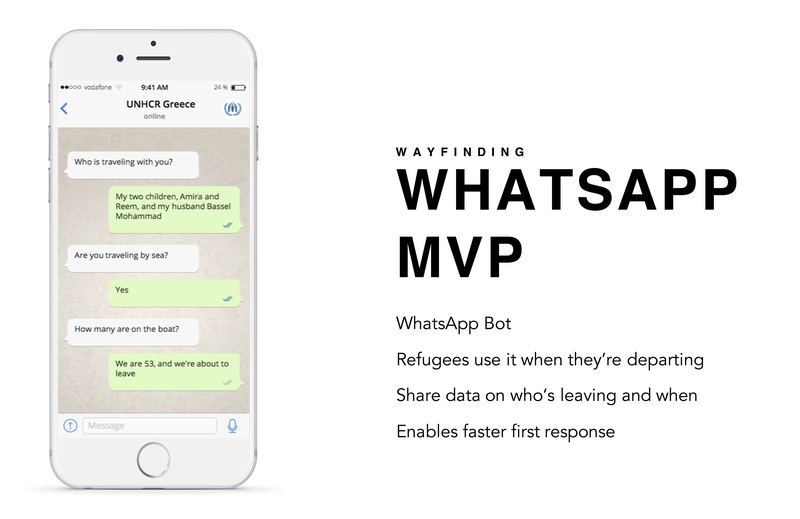 In week 9, they decided to build an AI chatbot on Facebook’s Messenger platform to allow refugees to ask questions like, “Where can I get clothing?” The bot will tap into a network of NGOs to source answers. A very basic prototype, built primarily by team member Kian Katanforoosh, a master’s student in computer science and management science & engineering, is already up and running. On the eve of Thursday’s class, team members Katie Joseff and Berk Coker had a call with the United Nations’ refugee agency, UNHCR, and learned that the organization was very interested in working with the students to bring an Arabic chatbot to the field, most likely starting in Jordan. Watching the students’ process and progress was an eye-opener even for many State Department sponsors and private-sector mentors. Team Space Evaders, who in week 7 seemed to be vying for the title of Team Whose Proposed Products Generated the Most Yawns from Potential Customers, had an “ah-ha” moment and decided instead of focusing on tracking objects already in space, they’d pivot and concentrate on objects that will be launched in the future. They’re proposing a “debris footprint” that would rate satellites before they’re sent into orbit on how much space junk they could generate. The team hopes that this could lead to international design standards to reduce space debris. Team members Dave Gabler, a master’s student in business and public policy with an Air Force background, and Matthew Kaseman, an Army vet and freshman in aerospace engineering, said the next step is to produce a white paper that fleshes out the mathematical formulas that could underpin a ratings system, then take that to academic and industry conferences. “That would help start a public discussion and push the debate,” said Gabler. Quintanilla said that working with Space Evaders drove home for him the merits of forming diverse teams to tackle problems. Besides Gabler and Kaseman, the student team included Kate Boudreau, a junior majoring in biomedical computation, and Tyler Dammann, a junior in computer science. Professor Jeremy Weinstein, a co-instructor for the class who recently served as deputy U.S. ambassador to the United Nations, acknowledged that 10 weeks is a really short time frame for the students to make any meaningful impact. But unlike an internship, where a lone student “plugs into an existing bureaucratic hierarchy and rules,” the Hacking for Diplomacy students had the advantage of being able to work in teams — and approach the problem more as outsiders. Thursday’s wrap-up session attracted a diverse audience, including representatives from leading Silicon Valley tech companies as well as diplomats from France, Britain and Denmark. Susan Alzner, head of the U.N. Non-Governmental Liaison Service’s New York office, said after watching the student presentations, she wants to take the customer discovery and interview methodology back to her agency. Weinstein noted that scaling up Hacking for Diplomacy may not be as easy as expanding Hacking for Defense, simply because “there are millions of people who work in the Department of Defense… while the size of the State Department foreign service corps is smaller than the total number of people who play in military bands.” That means there are fewer people who can serve as sponsors. Most of the State Department sponsors for this year’s class, Weinstein noted, were not political appointees but career foreign service officers or career civil servants. Like the students’ efforts, the teaching of this class was also a team project. I was joined by Jeremy Weinstein, former deputy to the U.S. ambassador to the United Nations and a Stanford professor of political science; Zvika Krieger, the State Department’s representative to Silicon Valley and senior advisor for technology and innovation; retired U.S. Army Col. Joe Felter, who co-created Hacking for Defense and is a senior research scholar at the Center for International Security and Cooperation at Stanford; and Steve Weinstein, chief executive of MovieLabs who teaches entrepreneurship at Stanford and UC Berkeley. Our teaching assistants were Shazad Mohamed, Sam Gussman and Roland Gillah. We were fortunate to get a team of seven mentors currently or formerly served in the State Department and selflessly volunteered their time to help coach the teams. Each team also got a mentor from the tech industry who helped guide them through creating their final products. Of course, huge thanks to the Stanford students who gave their all through this class. While our previous Hacking for Defense class gave us a hint that doing the same for Diplomacy would work, we’re a little stunned about how well this class with the State Department went. A surprising number of students have decided to continue working on foreign policy projects after this class with the State Department or with NGO’s. Other colleges and universities have raised their hands, and said they want to offer Hacking for Diplomacy or potentially a USAID Hacking for Development class at their school. Meanwhile our Hacking for Defense class continues to scale through H4Di.org the non profit we set up to curate the problems from our sponsors (JIDO, ARCYBER, AWG, USMC, NSA, AFNWC, SOCOM, 75th Ranger Regiment, USTRANSCOM, Cyber Force Protection Brigade, National Defense University, and the Center for Technology and National Security Policy). And H4Di.org supports the universities teaching the class this year: Stanford, UC San Diego, Georgetown, Air Force, University of Pittsburgh, James Madison University, Boise State, and RIT. If you’re interested in offering Hacking for Diplomacy (or Defense) in your school, or if you’re a sponsor in a federal agency interested in solving problems with speed and urgency, join us at our next H4D educators class January 17-19th at Georgetown.